After reviewing the DS916+ specifications and performing some rough calculations, it comes clear that this unit is totally capable of serving as a primary backup storage or a file server. Being user-friendly and feature-rich, Synology’s proprietary OS (DSM) can be used to turn the DS916+ into SMB/NFS NAS or iSCSI SAN in a few minutes. There are also many features useful for storage administrators: “active-passive” DSM HA Cluster, detailed storage performance statistics, network performance monitor, hardware status monitor and many others. According to our experience, “active-passive” HA configuration is not the best choice for production scenarios. One of the nodes in a two-node cluster is on standby in this case, so only the resources of a single node are used. 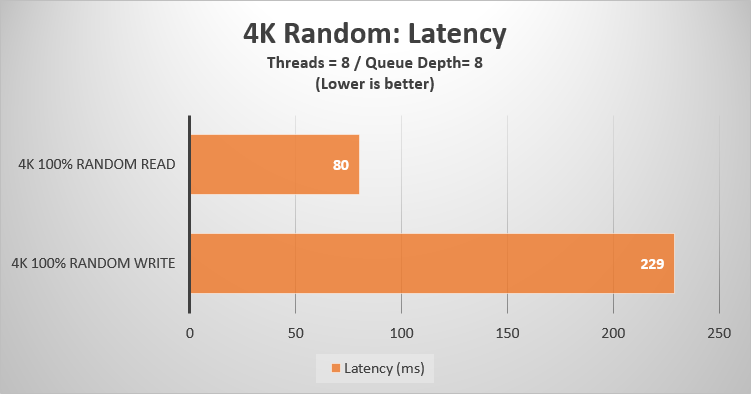 This means halving the possible throughput, worse read performance and higher failover time if we compare to “active-active” configuration. In order to confirm the above opinion, we decided to get ourselves a pair of Synology DS916+ and benchmark it. The main objective of our further experiments is to define whether a mid-range Synology units are capable of handling the light production workload typical for small businesses. We will also deploy a StarWind Virtual SAN Free on top of our Synology boxes and check how it performs. In our today’s article, we will run a set of benchmarks to measure the performance of DS916+ in different scenarios. 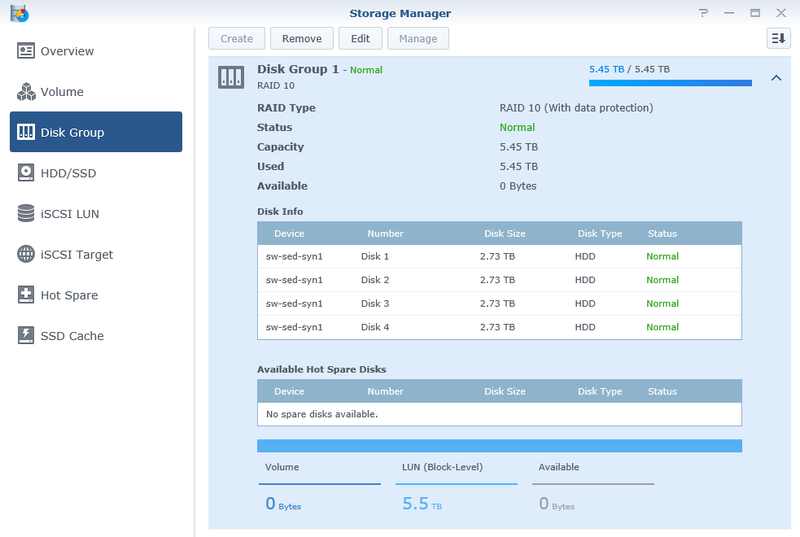 We decided to configure RAID 10 in order to achieve a balance between performance and redundancy. We do not recommend configuring RAID 5/6 on spindle arrays that will be used as virtual machine storage. 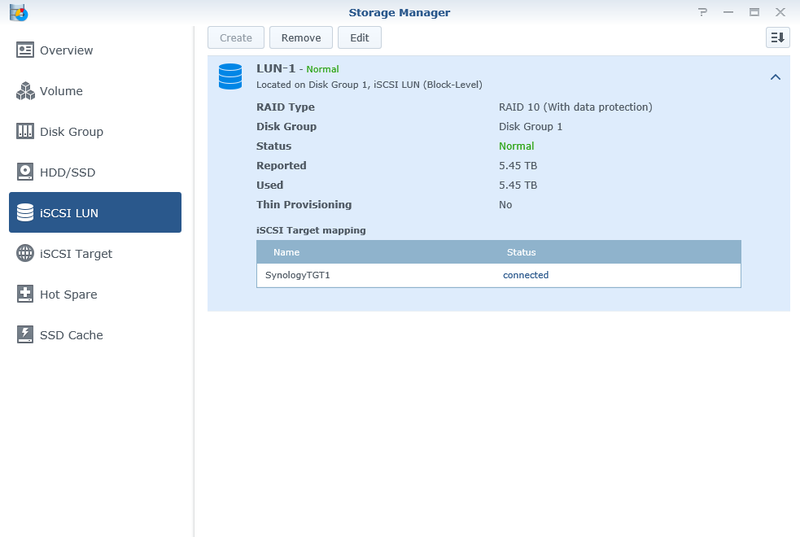 iSCSI LUN and the corresponding iSCSI Target were created on top of RAID10 drive group. All the tests listed below were performed using Microsoft Diskspeed tool. 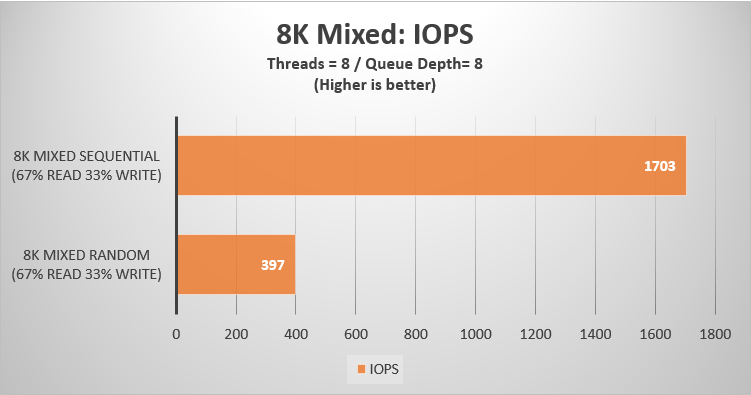 Our benchmark process includes a number of different access patterns that would help to monitor the storage performance under particular workload types. As you can see, we are covering the “industry standard” 4K; “production-like” mixed 8K; larger sequential 64K; and “backup ready” 256K patterns. 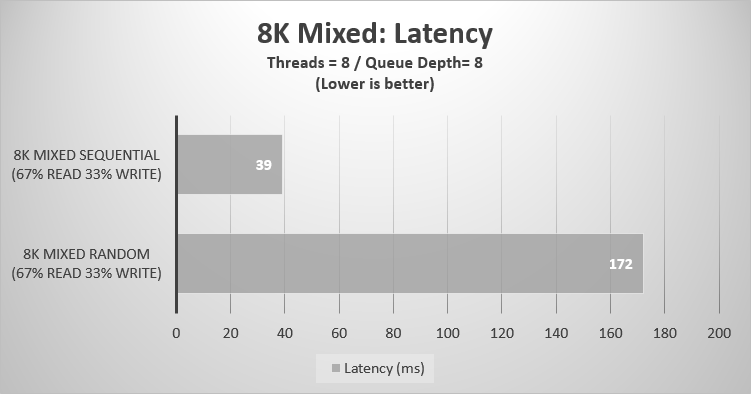 We have tested different Diskspeed Threads/Queues combinations in order to squeeze out the maximum performance out of our setup while keeping the latency at some acceptable levels. The final value was rendered as 8 Threads and 8 Outstanding I/Os. In this test, we are using only a single DS916+ box connected via two 1GbE networks to the Supermicro server. Supermicro OS is Windows Server 2016 with MPIO feature installed and configured in “Round-Robin” mode. The results meet our expectations quite precisely. Obviously, we have noticed a little struggle on write operations that can be justified since Synology systems are using software RAID. Moving forward, we have tried some “more real” access patterns. 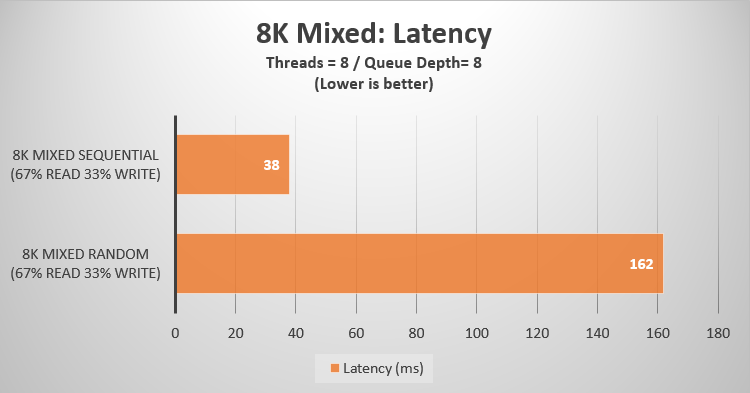 Consisting of the mixed (67% Read 33% Write) 8K I/O transfers, such workloads show less synthetic results and assist in better interpreting the achieved values. As clearly indicated in the result charts, our WD RE spinners prefer sequential patterns, which is not surprising at all. 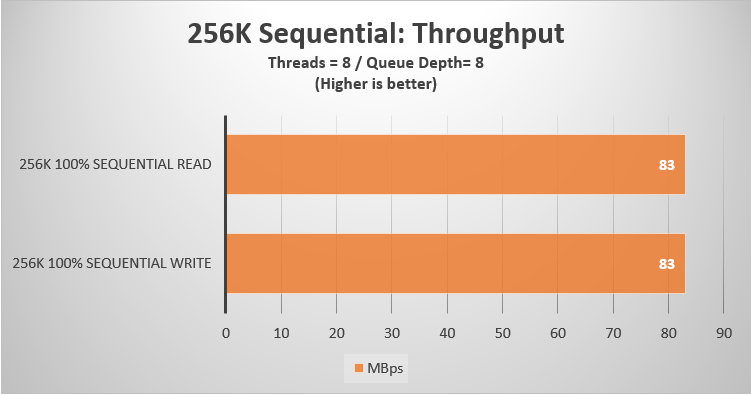 Continuing our tests, we have measured the performance of a larger 64K and 256K sequential patterns. Such workloads are typical for backup jobs and during file server operations. 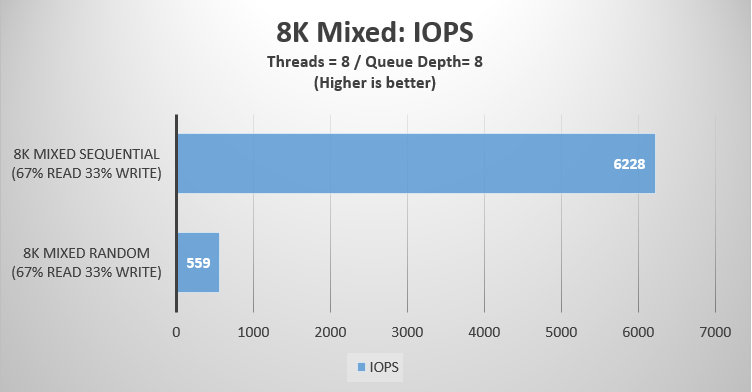 Due to the bigger block size, throughput numbers would be more relevant than IOPS. 229MB/s is a good result for sequential reads assuming we are reaching the network throughput limitation here. The network saturation was around 1.8Gbps out of 2Gbps possible (remember we have 2x 1GbE networks with MPIO enabled). Looking at sequential writes, the results appeared to be a bit different. We have achieved 100MB/s which is, surprisingly, just a half of the throughput declared for DS916+ model. 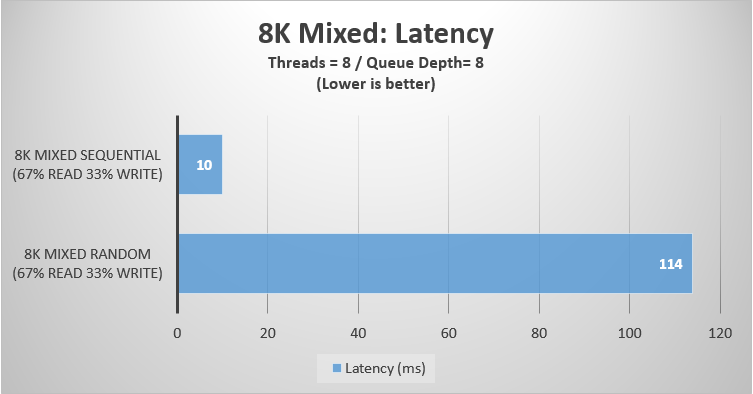 With the biggest sequential block size, we have achieved what we believe is the maximum array throughput. Summing up the results, we have seen that a single Synology unit is indeed capable of running 5-8 lightweight VMs. 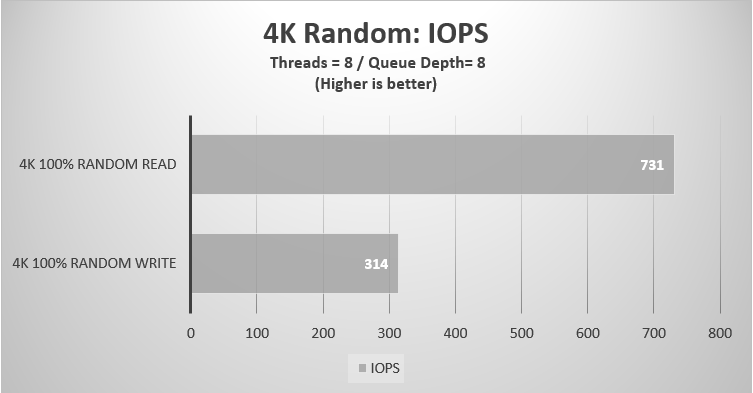 Moreover, sequential performance will be enough for a routine backup and file server tasks, which is obviously the main purpose for the majority of NAS units available on market. Year by year, due to the decrease of cost, HA solutions become more and more affordable to the small and medium business. It’s been a while since users can take advantage of the basic HA features on NAS devices, and our Synology model is no exception. 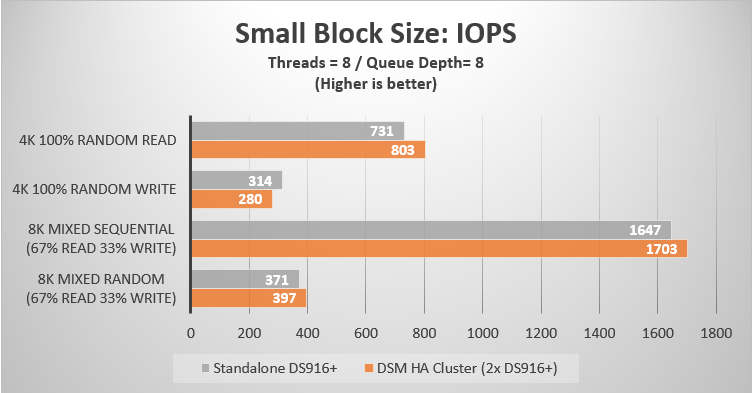 Thus, we decided to test a pair of our DS916+ units connected to a pair of Supermicro servers in DSM HA Cluster configuration. 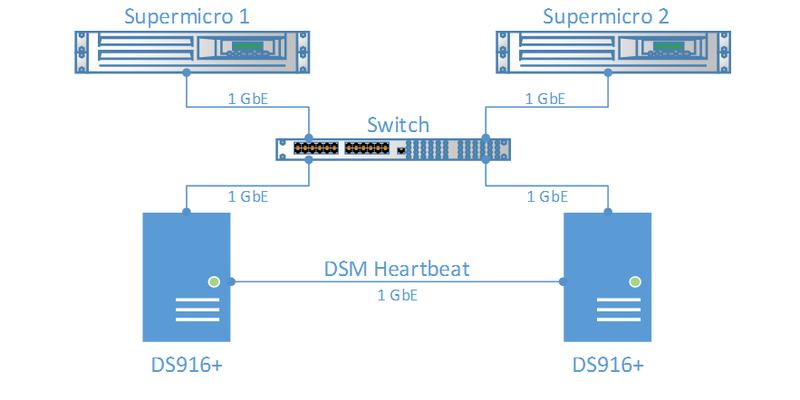 DSM clustering works in “active-passive” mode and Multipathing is no longer an option since 1x1GbE port on each unit is used for replication and Heartbeat. 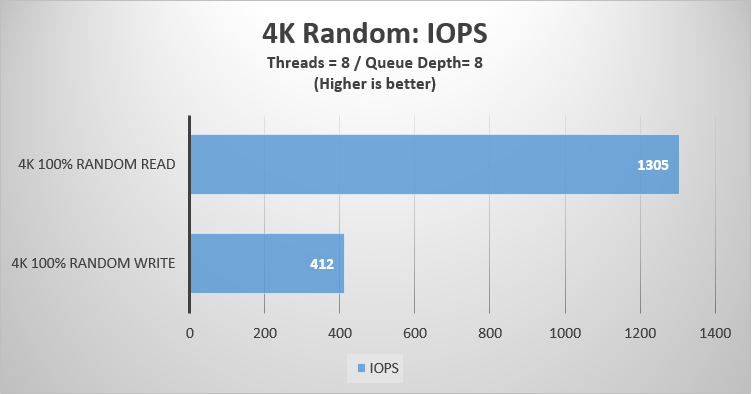 Read performance got better, while write performance has suffered a bit if compared to the results achieved with the single Synology unit. This time the achieved results are looking almost the same. Working under DSM HA Cluster configuration, we were left with just one active 1GbE port on a single “active” unit instead of two active 1GbE ports if compared to a standalone configuration. You can clearly see how the network throughput limitation impacts the large-sized workloads. 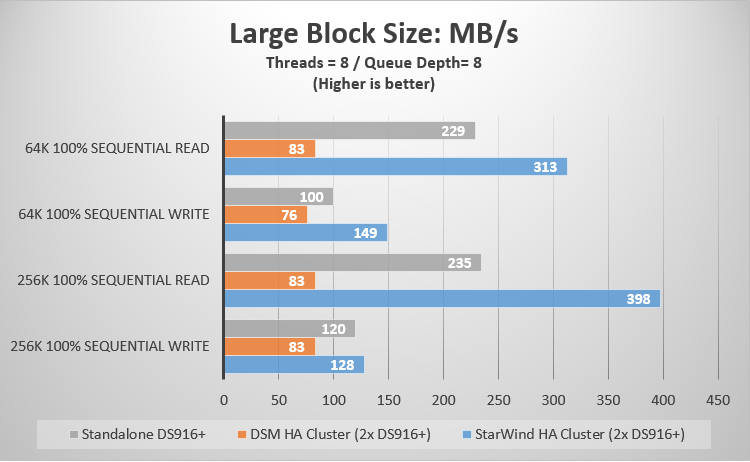 The results achieved in DSM HA Cluster are significantly lower if compared to ones of the single DS916+ unit. It seems that 83 MB/s is the highest throughput we can achieve in DSM HA configuration. It is also worth noticing that, surprisingly, we were not anywhere near to saturate even a single 1GbE port (125MBps) in DSM HA Cluster configuration. 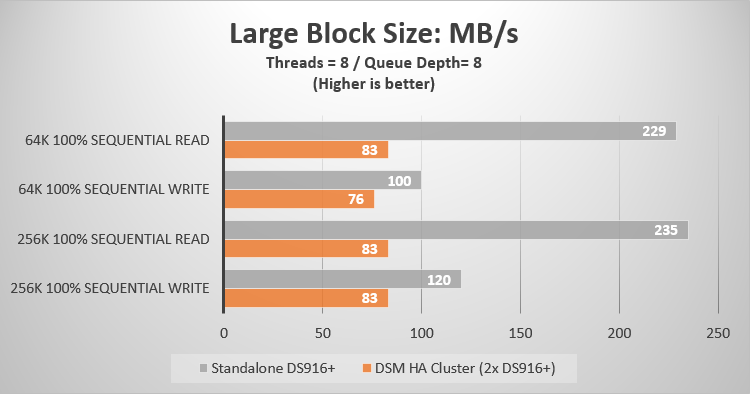 As we can see, DSM HA Cluster slightly outperforms a single Synology box during smaller block workloads, except “4K 100% RW” pattern where a single Synology unit got better by a small margin. Looking at 64K and 256K results, it comes clear that a standalone Synology box performs much better than DSM HA Cluster thanks to an ability to utilize the Multipath I/O in Round Robin mode. 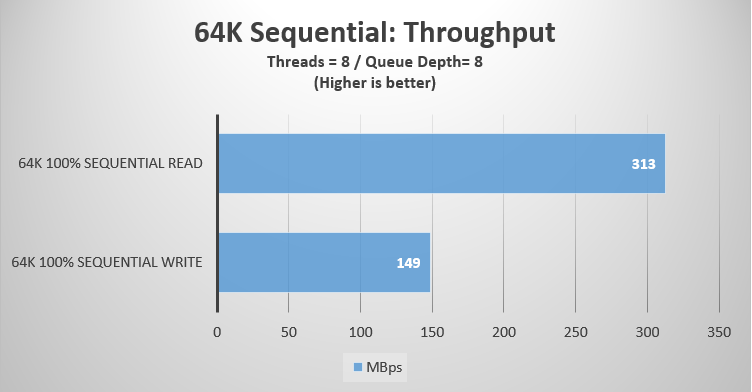 Which, basically, translates into 1GbE vs 2GbE of maximum possible throughput. 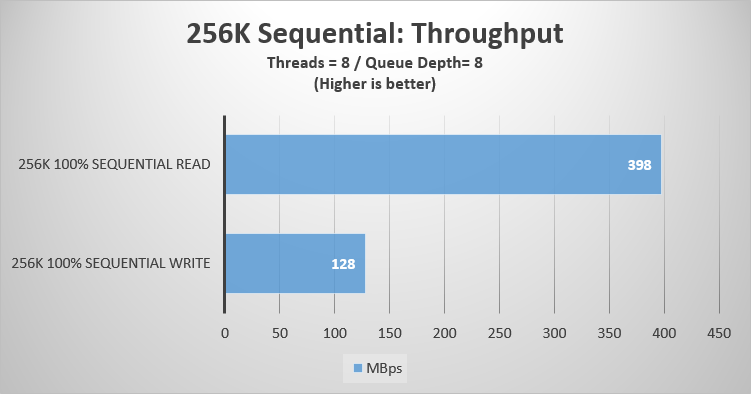 After reviewing results from the DSM HA Cluster benchmark, we have suggested that our setup should have a plenty of space for improvement, especially the 64K – 256K sequential performance. Large block workloads are quiet crucial for any production, even if their share is a relatively small portion of the total workload. With these thoughts in mind, we decided to rebuild our setup and replace the Synology DSM HA Cluster with StarWind Virtual SAN Free to handle the data replication. In our new setup we are using 2x Synology DS916+ units, each connected to the corresponding Supermicro server via 2x 1GbE networks. 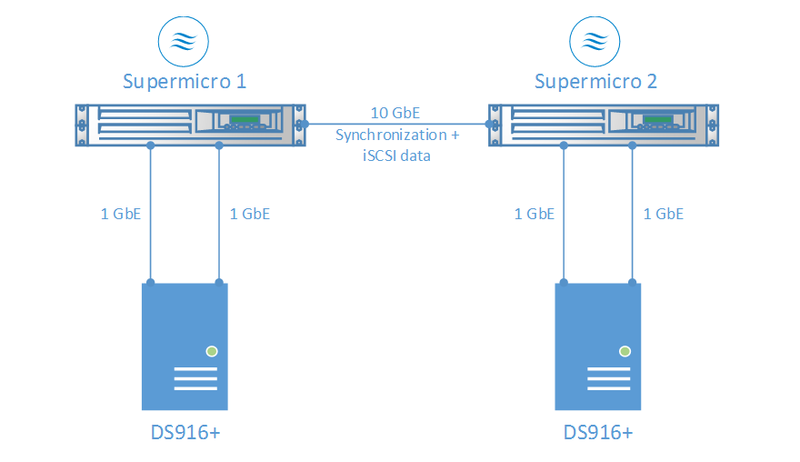 Supermicro servers are connected to each other via single 10GbE network that will be used for both StarWind Synchronization and iSCSI traffic. We are using 10GbE NICs to eliminate a possible network bottleneck. And this is where we can clearly see the benefits of Multipath I/O in Active-Active HA configuration. 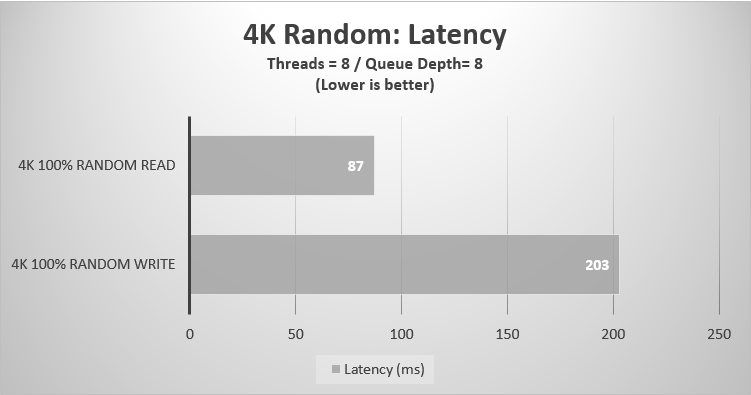 With an ability to utilize 4x active 1GbE iSCSI paths, StarWind device shows significantly better random-read performance and slight increase in random-write performance. Here we have seen an ultimate performance increase during the mixed sequential workload as well as a significant increase during the mixed random workload. Once again, this was achieved thanks to the ability of utilizing all available networks simultaneously. It is time to benchmark the throughput during large-block sequential access. We have achieved 80% (398MBps out of 500Mbps) network saturation on sequential reads, which is a really good result. 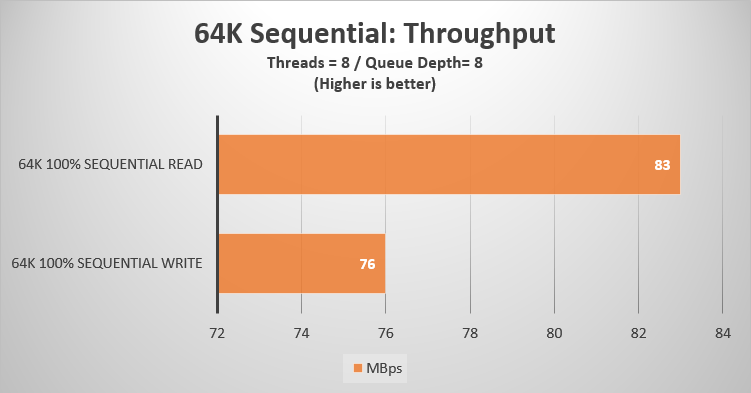 Moreover, throughout sequential read workloads, saturation increases with the larger block sizes and goes up to 88,5% during the 512K workload. Synology DS916+ holds an impressive set of features making it a great NAS solution for small businesses and enthusiasts. From the iSCSI SAN standpoint, a single spindle-based DS916+ unit, configured in RAID 10, can provide enough redundancy and performance to run a couple of lightweight virtual machines. However, after adding a second NAS device and configuring the native DSM HA Cluster, it became clear that such configuration introduces a network bottleneck due to the inability of utilizing more than one active 1GbE iSCSI path. Moreover, DSM HA Cluster’s “active-passive” configuration implies that only a single Synology unit is involved in data-transfer operations. In another words, meaning that the capabilities of only a single RAID array are being utilized. Performance impact is certainly visible after looking at the sequential workload results. Such limitations can affect the performance of file transfer operations, live migrations, VM cloning and backup jobs. To eliminate network bottleneck and increase the performance, we decided to change the “HA storage provider”. Obviously, we have chosen StarWind Virtual SAN Free for this purpose, since it can easily turn our configuration into “active-active”. Synchronous data replication in “active-active” mode makes it possible for iSCSI traffic to use all physical networks present in our NAS devices simultaneously. 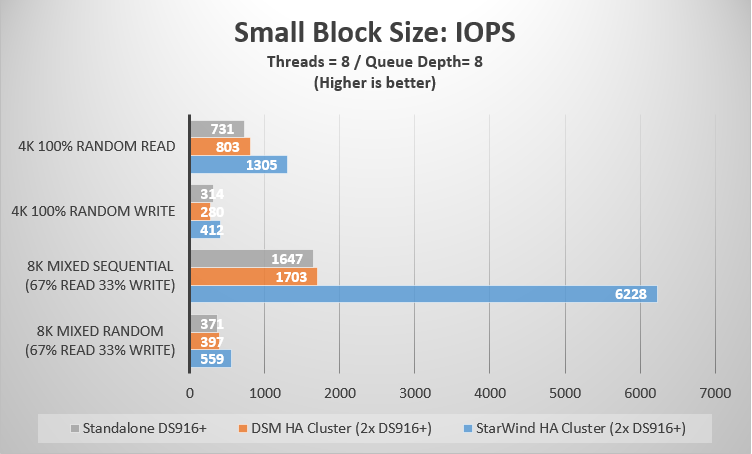 After conducting a set of benchmarks for each configuration type, we have seen that StarWind significantly outperforms both a single Synology DS916+ unit and 2x DS916+ units in DSM HA Cluster configuration. 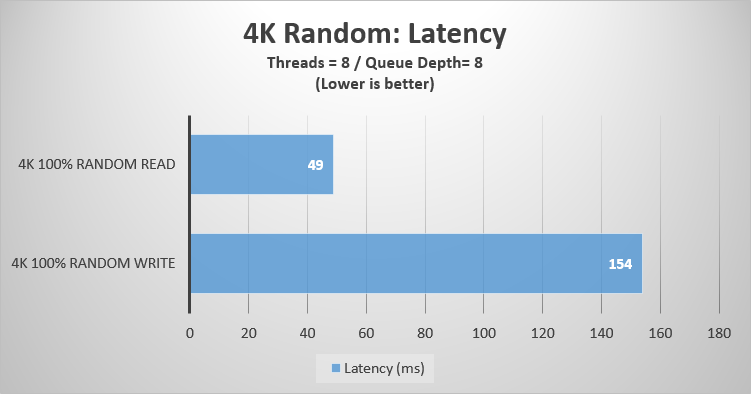 The most significant performance boost was achieved in the 4K 100% Random Read; 8K Mixed Sequential; 64K and 256K sequential patterns. We are satisfied with the achieved results and can recommend StarWind Virtual SAN Free+ Windows Failover Cluster as a good alternative for the native Synology DSM HA Cluster setup. Also, it is worth noticing that we did not enable iSER on StarWind targets during today’s benchmarks. We will definitely test our setup using StarWind Virtual SAN with RDMA-enabled networking in the nearest future. In the next articles, we will also test the iSCSI failover duration of Synology DSM HA Cluster and StarWind Virtual SAN Free since it is another important aspect of HA clustering. 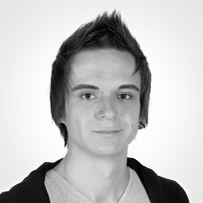 Senior Solutions Architect at StarWind Inc.
Vladislav is a Senior Solutions Architect at StarWind Inc. He has 5 years of IT experience focusing on storage virtualization, clustering, and high availability. Has a broad knowledge of architecture planning, storage protocols, hardware sourcing, and research.